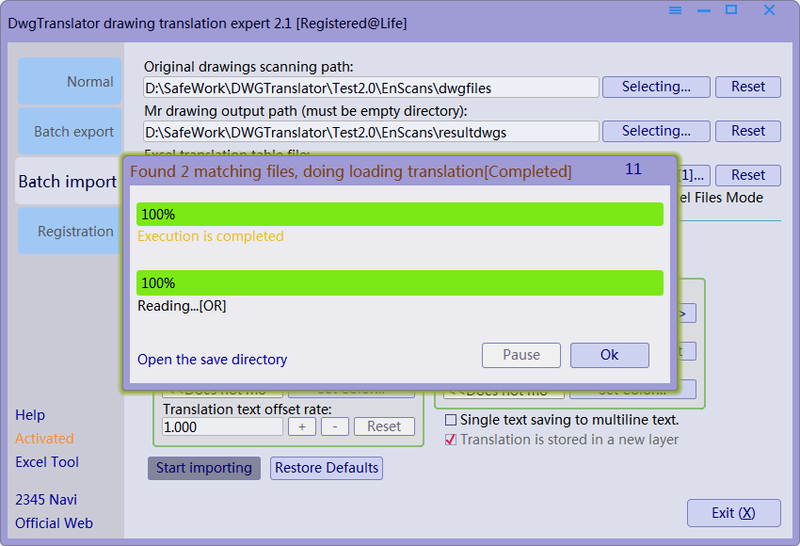 DwgTranslator is a very useful tool for the drawing translation industry, providing functions to batch export and import texts from blueprint, while supporting online translation. 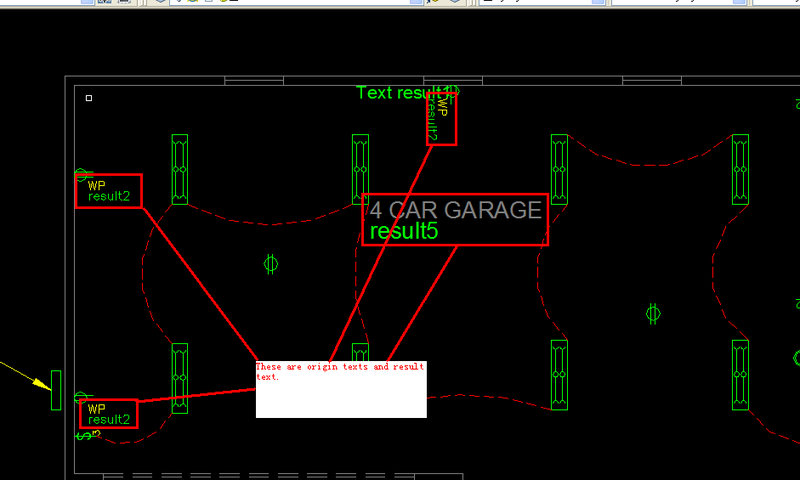 Software has powerful text objects intelligent sorting, selection filtering. Supporting all global languages, supporting result output with new text's font/size/height/color setting, and can write result drawing with bilingual language texts. The software has been a number of industry praise. 1. 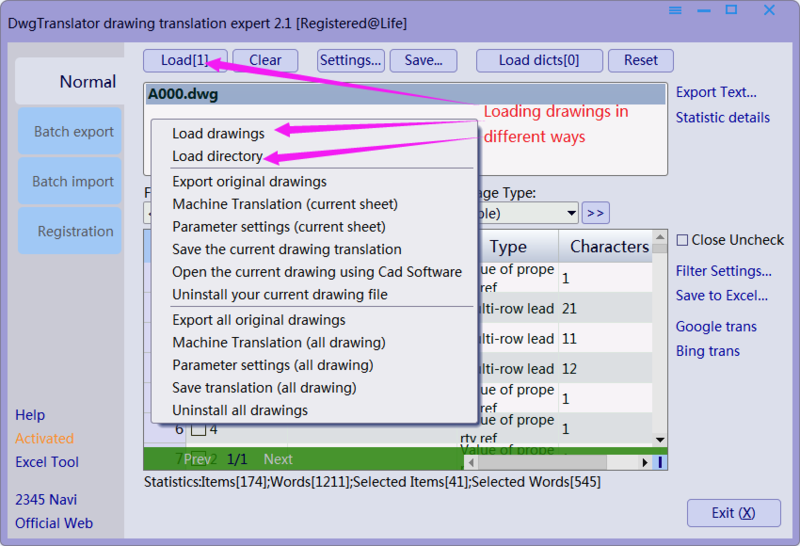 Support for the latest version of DWG 2013 format, and supports a large drawing file handling. 2. Support all types of entities text objects (including single-line text multiline text annotation table attribute values, etc.) to extract replaced. 3. Support batch scanning to extract original, one-time extraction of data in the original directory of all drawings within set according to filter settings. 4. 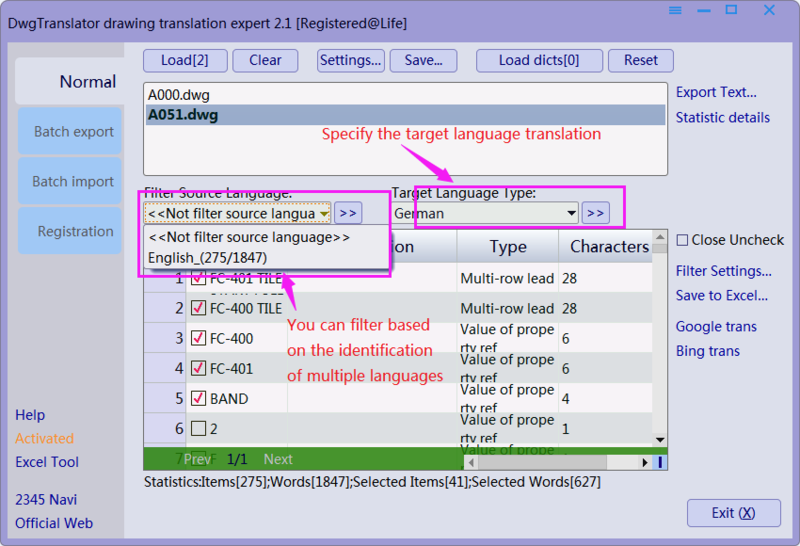 Original saved using Excel file format to facilitate translation freely distributed translation tasks , and to ensure that the translation is written translation of the column can be. 5. 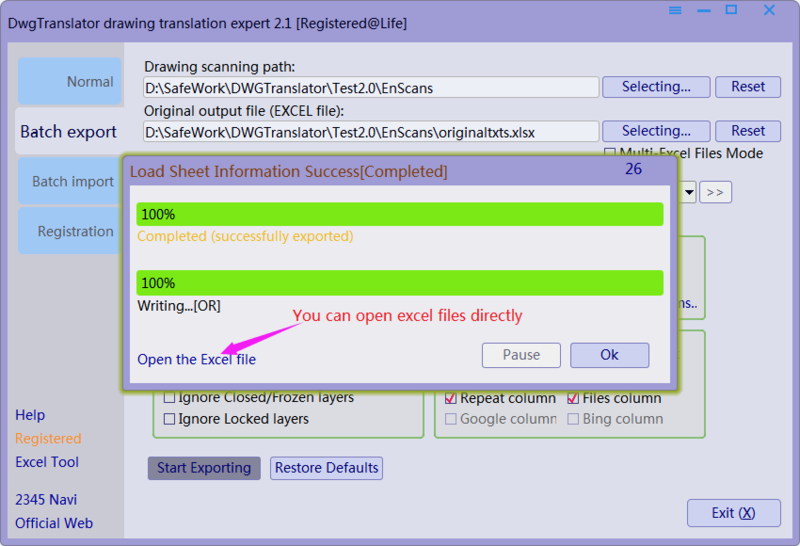 Support batch write back translations, according to the set parameters and write configuration translations Excel file, directory under the one-time scan of all drawings, executed translations and then save the text to match the drawing. 6. Support typeset output, adjustable output text font color output word position parameter higher. 7. Support onlining Google / Bing translation. Excel also provides translation of documents / merge operations processing tools. 8. Common translation results can be used as a backup to use translation dictionaries, you can load multiple translation dictionary automatically executed when a write match. 9. Package offers free cad plug-in tool for text aligning and merging. 10. The software runs only need supported by Windows.Excel, does not rely on other Cad Software. Perform automatic translation, click on Start All translations, the software will automatically translate all the drawings (dictionary translation, Microsoft Translator, Google Translator). 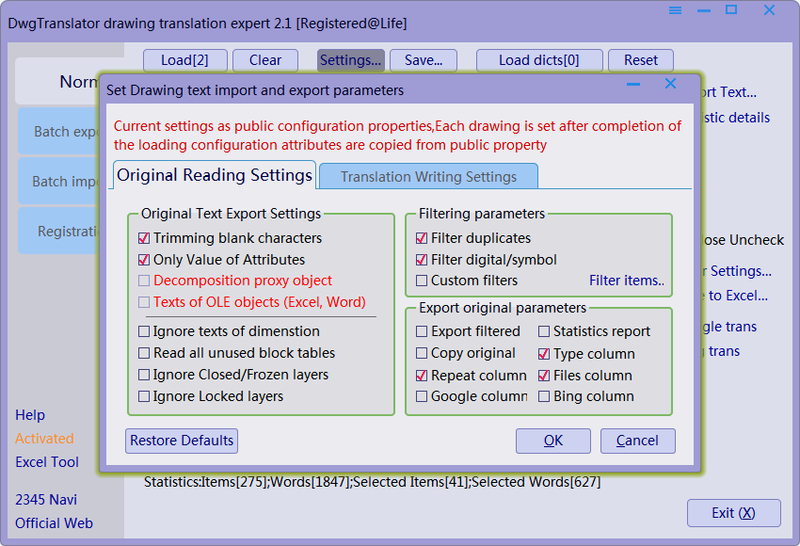 Batch export Excel files, all drawings within the selected text entries are exported to Excel files, support for dictionary translation results, Microsoft Translator results, Google translation results were the same as the output to Excel. 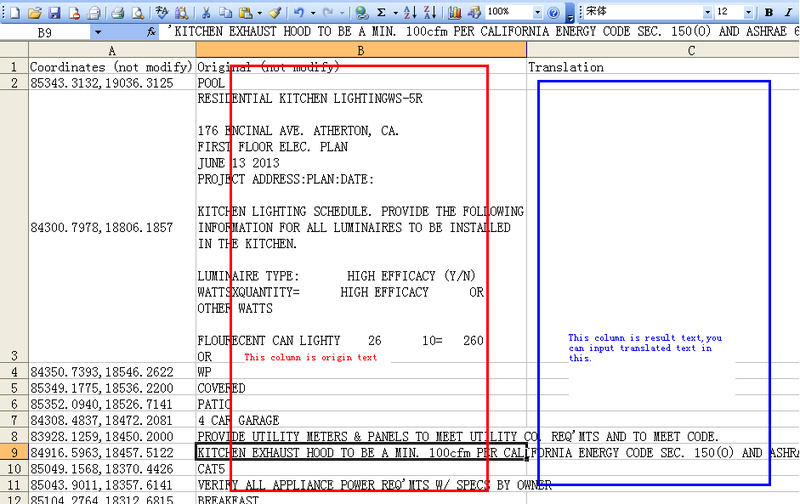 Filter Settings: Software supports various conditions filter on text selection set.